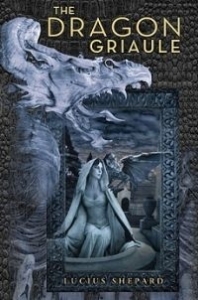 You are here: Home » MEDIA » Books » The Dragon Griaule by Lucius Shepard (book review). The Dragon Griaule by Lucius Shepard (book review). The dragon Griaule is 6000 feet long and has been lying dormant in the hills for thousands of years exerting his influence over the surrounding country. This collection brings together six short stories and novellas about this enormous dragon, giving different perspectives on his life and influence. ‘The Man Who Painted the Dragon Griaule’ tells the story of Meric Cattanay, a man who in 1853 proposes to kill the great dragon by painting an enormous mural on its side and thus slowly poisoning him with the toxic compounds in the paint. In ‘The Scalehunter’s Beautiful Daughter’, we get a glimpse of the inner workings of the dragon as we journey with Catherine inside his vast body. ‘The Father Of Stones’ takes us to the nearby town of Port Chantay, where a man accused of murder is pleading innocence because it was the dragon’s malevolent influence that caused him to commit the atrocious act. ‘Liar’s House’ is Hota’s tale of the beautiful woman he met on the dragon’s back and their unusual relationship. ‘The Taborin Scale’ is the story of George and Sylvia, mysteriously transported to another time at the whim of the dragon Griaule, but for what purpose they do not know. Finally, ‘The Skull’ brings us to a modern-day story set in a deeply political South America, where a young woman is leading a cult obsessed with the large dragon skull hidden in the jungle. I’m hard to convince where short stories are concerned because I generally find it difficult to get really drawn into a story that’s over so quickly. However, this collection was absolutely superb and easily the best collection of short stories and novellas that I’ve come across. The strong linking theme certainly made a difference as with each story the reader finds out just a little bit more about Griaule or learns to see him from a different point of view. Yet even with the very first story, ‘The Man Who Painted The Dragon Griaule’, coming in at just 30 pages, I was completely hooked. The idea of a 6000 feet dragon is almost incomprehensible and although Griaule is central to all the stories, at the same time he is a peripheral element, an unseen force acting to guide the humans to meet his will. This means that while this is essentially a book about a dragon, it’s really a book about people. My personal favourite remains the first story, ‘The Man Who Painted The Dragon Griaule’ as it hooked me right from the start. I’m a fan of dragons in general, so to be introduced to this enormous beast was quite magical and it was all so vividly described that it was easy to get lost in the story. ‘The Father Of Stones’ also appealed to me, as it has so many things for you to puzzle out yourself that you have to keep reading just to find out which are the true answers after all. It also has a fairly sinister undertone to it which really built up the atmosphere. I think ‘The Skull’ is my least favourite as it felt a bit too deliberately political and lost a lot of the magic and mystery that was such an enjoyable part of the other stories. It was still a good story, it just felt a bit out of place with the tone of the rest of this collection and I think I’d have been perfectly satisfied if the collection had ended after ‘The Taborin Scale’. This is a beautifully written collection of stories. The descriptions are vivid and, even in the shorter of the stories, the characters are fully drawn individuals. There are plenty of twists to keep the reader guessing as we try to work out what Griaule intends for the characters and sometimes even if it is his influence at work or just the dark, manipulative side of humans looking for something else to blame. All in all, this really was a superb collection of stories and I will definitely be seeking out more works by Lucius Shepard. « Science fiction travels Beyond the Sun?